UPDATE (8/27/17): The UMMB will number OVER 400 for the first time ever in 2017! That means we need more uniforms! So with another BIG THANKS for helping us meet the original $160,000 goal we ask you to help us with an additional $40,000! Please make a tax-deductible gift now… you can even set-up automatic payments to fit your budget! We’re getting so close to retiring the band’s current uniforms. We’re so close, the 2017 season will be their last. As the Minuteman Band takes the field performing the music of Natalie Cole ’72, Elton John, and Tchaikovsky, its new uniforms will be getting made! Through a number of grassroots fundraising activities, alumni have taken the lead on raising the $160,000 to fund this very important project! We’re still actively seeking YOUR HELP! As an added bonus, anyone who gives $500 will receive one of our current uniforms. If you are an alum of the Power and Class of New England (or perhaps a parent of one), what a perfect keepsake?! Gifts can be paid in installments, monthly, or quarterly; in full; or even in multiples of $500 if you really love the UMMB and want to outfit the family! Every gift helps us get closer to this goal. 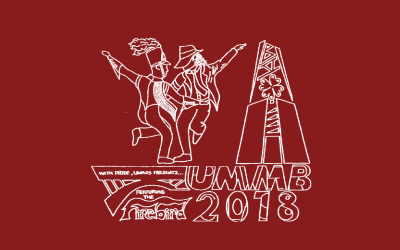 You all know what a UMMB performance is like; how much better can it be with a brand new look? Our goal is to have the entire band in new uniforms for the 2018 Rose Parade! I know we’re up to this challenge. 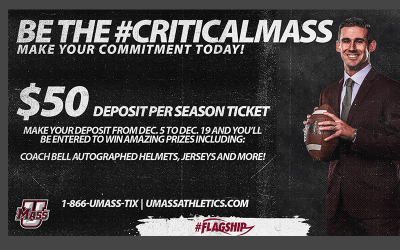 Thank you for your continued support of the Power and Class of New England and, as always, GO UMASS! 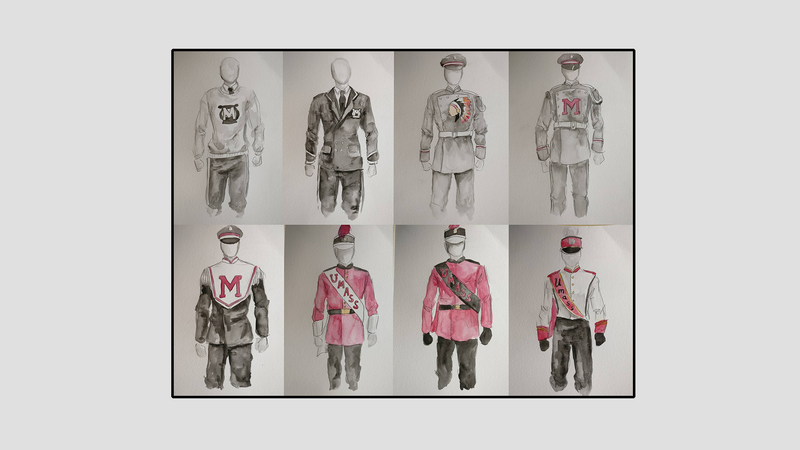 CREDIT: Watercolors of historical band uniforms by Abbi Greene. 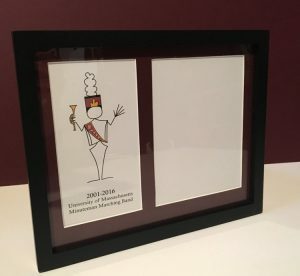 Band alumna Cait (Merrigan) Harrison ’06 is offering a stylized illustration of a UMass Bando in a matted frame, including space for a photo. The 1982-2000 or the 2001-2017 uniforms are currently available, with plans to expand the selection. $10 of each order goes to the Uniform Fund.